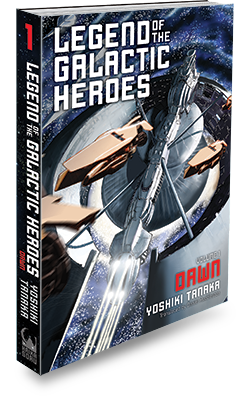 ﻿ Legend of the Galactic Heroes, Volume 1: Dawn « Haikasoru: Space Opera. Dark Fantasy. Hard Science. The "golden brat” Reinhard von Lohengramm, a military prodigy and admiral of the Galactic Empire, has ambitions beyond protecting the borders or even defeating the empire’s enemies. He seeks to overthrow the old order and become a truly absolute—yet benevolent—dictator. His rival, the humble Yang Wen-li of the Free Planets Alliance, wishes to preserve democracy even if he must sacrifice his political ideals to defeat the empire. Their political and military battles play out over a galactic chessboard in an epic saga fifteen centuries in the making! And now, the LEGEND OF THE GALACTIC HEROES giveaway contest winners! At that moment, the Second and Sixth Fleets of the Alliance were reeling from shock, having only just learned of the sudden change of circumstances. Even so, they had not decided to veer from the original plan and were still advancing toward the battlefield at the same velocity as before. Yang’s expression and tone of voice seemed indifferent. As Vice Admiral Paetta observed him, he kept opening his fist and then squeezing it shut, trying to exorcise his annoyance. A note of deliberate reproach was apparent in the vice admiral’s tone. That is one cold-blooded thing to say, he was thinking. Yang’s tone was curt, whether he knew what was going on in the vice admiral’s head or not. “Enough, Commodore.” The vice admiral cut him off, displeased. He couldn’t hold back his disgust for this young staff officer who just wouldn’t give him the answer he wanted. The vice admiral motioned for Yang to sit back down and turned his head back toward the screen. The flagship Leonidas was now a colossal hunk of metal wandering in the void. Within, there was nothing left that lived. The body of Commander Pastolle had been sucked out into the vacuum by the air-pressure differential in the instant that concentrated enemy fire had opened up a large crack in the bridge’s hull. What condition his corpse was in and where in space it was drifting, nobody knew.